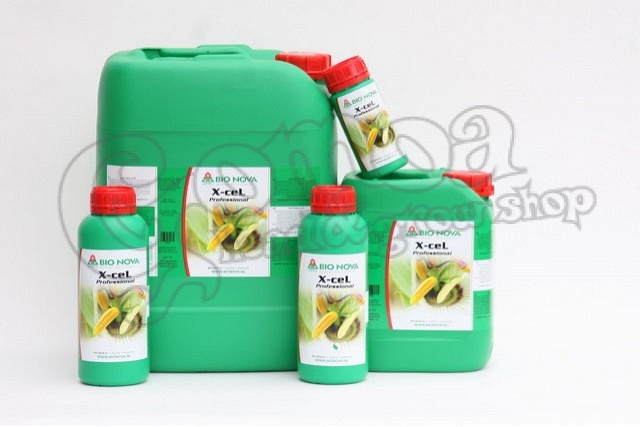 X-ceL Booster is a biological growing and flowering stimulator, which can be administered to all sorts of plants and significantly increases the quantity and quality of all tested crops. This sophisticated combination of components stimulates the bio-chemical functions on all levels. The organic extracts stimulate the metabolism, in particular the photosynthesis, and consequently the forming of carbohydrates. The hormone household of the crop is actively stimulated by the combination of amino acids. X-ceL Booster actively takes part in the growing and flowering process from the first day of planting. The crop strikes root more quickly which virtually rules out the dropping of leaves. The plant will grow more rapid and vital, while it simultaneously develops a very extensive root system. The potency of flowering is stimulated and eventually leads to a demonstrable increased yield (10-25% increased yield).